In my U.S. History class, we are currently studying the American Revolution. At first I wasn't overjoyed to be learning about this time period; I would much rather be learning about WW2. But as I was immersed more and more in the subject, I soon found that I loved it almost as I love the 1940's (which I never thought would happen.) So when our teacher, Liz, told us she had bought over $500 dollars worth of narrative non-fiction books about the Revolution, I got really excited. Reading and history together, what could get better than that? 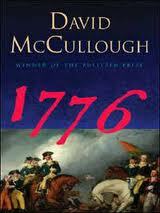 The students had the choice of which book they would read and I chose 1776 by David McCullough. I delved into the book ravenously, absorbing every word. I ate it up, almost reading too fast that the words started to blur together, and sometimes I would have to reread to completely understand. I'm currently still working on finishing the book, which I know, is surprising. If I had all day to just read, I would have finished it by now, but sadly I don't. Now, other then showing you a new book, I also wanted to share what this book sparked for me in the world of writing. As I ate up the information and facts about the American Revolution, I also started to think of characters that would live during this time period and stories that could be written. This book brought me inspiration for a possible new writing piece, which made me think of why reading is so important for writers. Not only do you learn about your craft, but maybe you can come up with some new ideas that you can include in whatever you may be writing. I discovered a story about the revolution and two boys named Prosper and Henrie. This idea of inspiration is not only for fiction writers but also for freelance writers, non-fiction writers, and maybe even scientists. For example if you're a scientist and you come across the idea of photosynthesis in snap dragons, maybe you'll get a spark of inspiration to research snap dragons! Now I'm not saying all books will bring instant inspiration, but if you continue read different books hopefully you'll find that spark. I personally recommend 1776, but that's just an idea. All and all, my final message to you is, read, it may change your writing career in more ways than you ever thought possible! I love the idea of trying out a book you might not normally read and finding inspiration! David McCullough does a wonderful job of bringing history alive. I love to read history a lot more now than I did when I was in school. I'm interested in reading his Americans in Paris book as soon as I have the time. I've heard 1776 is a great read, and I'm happy you are enjoying it and using it as a source of inspiration! Yay! I used to bemoan history class every year because we'd study the same old thing every time: The Civil War. Now I'm sucking down Civil War books left and right as I right my own story that takes place just before the fighting breaks out. Being interested for your own reasons makes all the difference.